The air eld at Broughton in North Wales has been a key part of British aerospace history since 1939, when a ‘shadow factory’ manufactured Wellington and Lancaster bombers for the war effort. The site’s hangars have more recently been owned by a number of large companies, producing iconic aircraft and offering maintenance facilities. Noted for its rapid response capabilities, the engineering team at Broughton operates as the design authority for the RAF Sentinel R1 and Shadow R1 aircraft, providing continued modi cations and maintenance for both eets. Delivering the airbourne capabilities of the ASTOR monitoring system, the Sentinel R1 relies on Broughton to service its on board Dual Mode Radar (DMR). 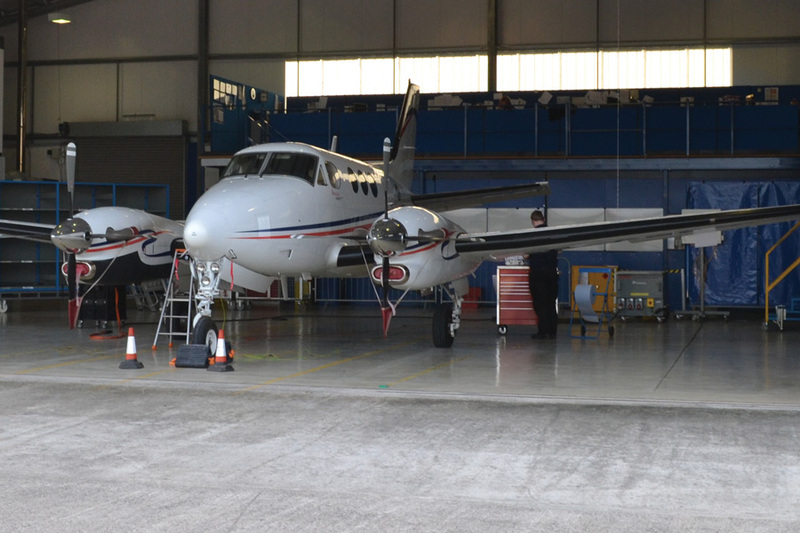 Occupying Broughton air eld for the last 20 years are Raytheon UK, providing a service support for light commercial and defence aircraft. They currently have 120 employees on site, as well as a edgling apprenticeship scheme thanks to links to Coleg Cambria, which will see seven students become fully quali ed engineers and go straight in to employment at Broughton. Raytheon UK is part of global technology and defence electronics rm Raytheon Company, who employ over 61,000 people worldwide and generated $22.8 billion in 2014 sales. Raytheon Company has multiple locations and of ces around the world; in recent years Wales has become an increasingly important and integral part of Raytheon UK’s business growth and innovation strategy. So much so, the site at Broughton is now considered as a major centre for strategic investment to win tenders for new key programmes worldwide. Key to this success was the Welsh Government’s support, assisting the company to establish Broughton as a Centre of Excellence for design and programme management, in addition to research and development activities that will ultimately go on to create more high-skilled jobs for the Welsh and UK economy. Roger Shone, General Manager of Raytheon UK, has worked at Broughton Air eld for 34 years. He commented: “Now that we are working closer with Raytheon in the US to support business development, there is an opportunity to win new contracts which will then be serviced at Broughton. Consequently we will need room for expansion.